Sophomore midfielder Manny Lopez running to the fans in the rock bowl after scoring his second goal of the night. Lopez scored the last goal less than a minute ago of game time. Lopez now earned four goals this season.Sophomore midfielder Manny Lopez running to the fans in the rock bowl after scoring his second goal of the night. Lopez scored the last goal less than a minute ago of game time. Lopez now earned four goals this season. The Loras College men’s soccer team is flying high on a seven-game win streak after their wins over Buena Vista University (4-0) last week on Wednesday, Oct. 3 and Luther College (2-0) last Saturday, Oct. 6. Both were conference games which helps the team in their placement for post season. “It puts us in the driver’s seat for the Iowa conference which we always want to be in and puts us in the driver’s seat for hosting the conference tournament which is what we want to be playing at home. We do really well at home and get our home fans so there’s a lot of things on the line,” said head coach Dan Rothert after Saturday night’s win. This past Saturday, Oct. 6 was also Latino Heritage Night where the game was announced in Spanish and there was with Latino music playing throughout. The atmosphere was ecstatic and the game was just as impressive. For the first half, both teams were going back and forth with several shots with Luther outshooting the Duhawks 16-8. However, defense on both sides stood strong until the next half. 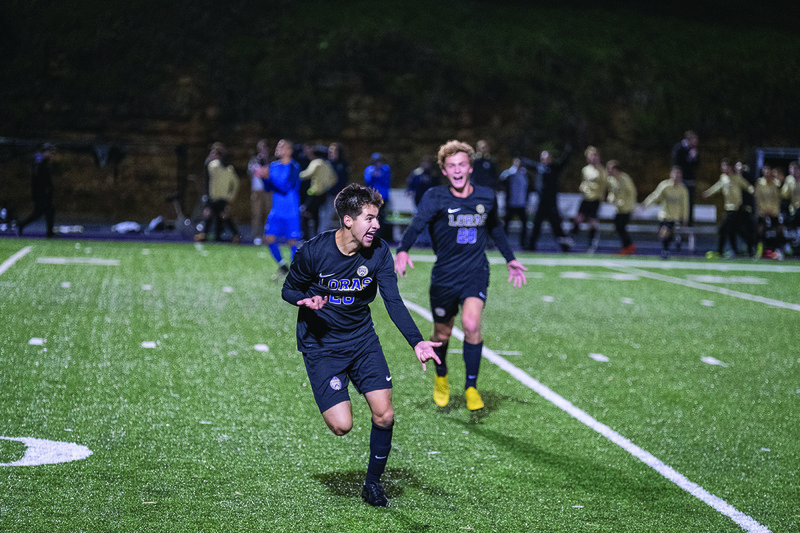 Sophomore midfielder Manny Lopez broke the silent scoreboard by converting a penalty kick in minute 69 that was drawn by senior forward Ryan Ross. Not a full minute later, Lopez finds the net again with a left foot bomb at the front of the box. These were Lopez’s third and fourth goals for the season. Both teams continued to fight, but Loras College was able to stick out the final 20 minutes getting a jump over Luther in the American Rivers Conference. The Duhawks have now improved to 9-1-0 overall and have remained perfect in conference. Last Wednesday against Buena Vista University, the Duhawks were able to stay aggressive and consistent the whole match. In the sixth minute, Loras was already tallying their first goal which was scored by senior midfielder Chris Alfaro off his own rebound. In minute 24, sophomore forward Tigrio Huerta rips his first goal of the season. Huerta was assisted by senior defender Ryan Pacholski. In minute 43, Huerta comes back to nail his second goal of the season from a pass from the 50, past a defender and shot. The last goal comes in minute 88 by junior forward Raudel Fierro shooting 22 yards out. This was Fierro’s first goal of the season. Loras College is hitting the road this Saturday, Oct. 13 to Indianola, Iowa to take on the Simpson College Storm. This American Rivers Conference game will take place at 3:30 p.m.